This may come as a shock, but not every wrestler’s dream is to become a cagefighter. Many of these athletes who have made the transition from the college mats to the UFC’s Octagon never expected a pro career in this multifaceted sport. They hang up their shoes and singlet in search of a simple life without the endless grind to improve or the laundry list of injuries that follow. That’s all well and good until that tamed animal gets lured back to its natural habitat - a gym - and they get the taste for competition again. It’s a story former 2x NAIA National Champion wrestler Mike Rio knows all too well. All it took was an afternoon of sharpening his claws at a nearby fight academy and Rio was hooked. The wrestling standout from Lindenwood University began training and tangling full-time in Florida’s local MMA circuits, rattling off an 8-1 record between 2008 and 2011. From there, “The Wolverine” caught wind of a tryout for The Ultimate Fighter and successfully made it onto the 15th season. 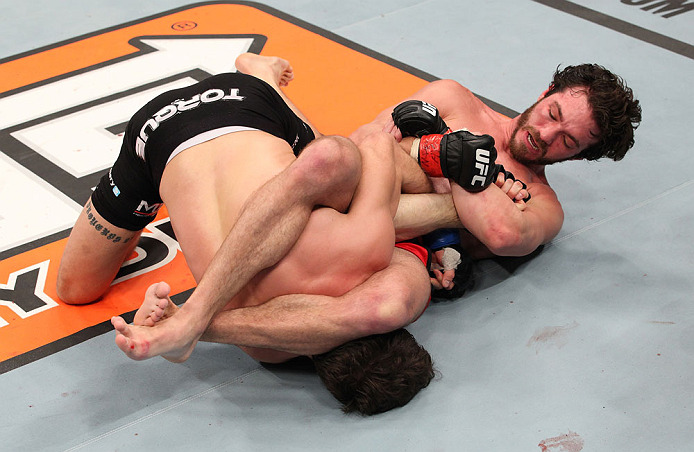 While two injuries (knee, ribs) in the house sidelined him for much of 2012, Rio made his Octagon debut in December at the TUF 16 Finale with a head-turning third round armbar submission win over castmate and fellow college wrestler John Cofer. It was a tale of takedowns, with Rio’s ground game being the deciding factor in the bout. All told, “The Wolverine” shot for 11 takedowns in the near three rounds, clearly not being shy about his intentions. In the opening round, Rio was only scored on one attempt and got caught underneath Cofer in the closing moments. Round two, he landed consistently with a jab and took his opponent’s back briefly. The final five minutes would determine the victor, but Rio wasn’t in a hurry to hear any scorecards read. Up next for the 31-year-old Rio is a nine hour plane ride to Jaraguá do Sul, Brazil to tangle with home favorite Francisco Trinaldo at UFC on FX 8. The 12-2, former kickboxer actually made his way into the UFC by fighting at middleweight on the first season of TUF: Brazil. Trinaldo went on to win his first fight inside the Octagon at 185 pounds before dropping to 155, where “Massaranduba” has gone 1-1 since, including an arm triangle choke over C.J. Keith in January. To prepare for Trinaldo, the Cuban-American is sticking to South Beach for all his training needs. Rio’s home gym is at Zen Jiu-Jitsu in Miami with BJJ and taekwondo black belt Enrico Cocco. The two oversee their own team of up-and-coming amateur fighters, delightfully named the “Zen Jiu-Jitsu Death Squad,” who Rio hopes he can coach through the ranks, into the TUF house, and into the Octagon like his own journey. “The Wolverine” is very proud of the city and area he comes from and would love to see it turn into a hotbed for MMA talent. Lastly, a day’s work is only half done when Rio leaves the gym, as “The Wolverine” sinks his teeth into an even greater role: charity spokesman. The specific charity is Autism Speaks, which was founded by former President and CEO of NBC Universal Bob Wright and, his wife, Suzanne Wright. The cause is a personal one for Rio, as his younger brother, Steven, is autistic. With his own strength and help from a very supportive family, Rio’s brother has accomplished a lot and is an inspiring story for others with the disorder. As Rio grows with popularity in the UFC, he is bringing the same competitive edge for sports to spreading awareness and raising money for this cause.